The lyrics came to me one day in the shower after years of struggling with buckthorn removal. 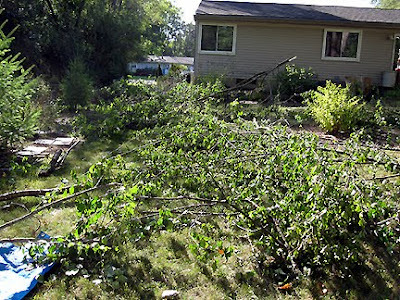 Click for a buckthorn fact sheet from Ann Arbor Narural Areas Preservation. You sing so well! I think Rose is right someone is going to call you for an audition! Buckthorn inspiration is usually more immediate for me. I've been known to spout some pretty colorful "French" when dealing with those thorny things. Still, it's much better than listening to me sing. Oh Monica, we are both clapping paws at your great performance! That really showed the Buchthorn. That said I found your performance to be inspired. You really sang from the heart and the lyrics communciate the depth of feeling that you have for the subject. I've watched it a couple of time now and I get a kick out of it every time. Especially when the class joins in. na dann: Nichts wie weg mit dem verdammten Sanddorn! Er macht das Garten-Leben ja zur Hölle. ROFL.... What a hoot Monica. I love this rendition of your poem. I hope it made you feel better by singing this. It sure made me feel better. This made me laugh - but I'm very envious of your voice ...I have the musical abilities of a dead slug! Already commented on Twitter & your YT Channel, and it's fun to see Scorn of Buckthorn on the blog, Monica. Had a bonding moment with you when you mentioned the shower - many of my songs were birthed underwater, too. Like Frances, Philo & I dressed as Vikings for a big party. & as Mr Brown Thumb says... what a great moment when everyone sings along! Bravo! This was great fun to watch ~ you have a wonderful voice. You are so creative with your lyrics! More, more, please!!! !